Folding Equipment Company has been servicing our Northern Ohio & Southern Michigan customers since 1949. Our customers include: public and private schools, universities, churches, contractors, businesses and architects. 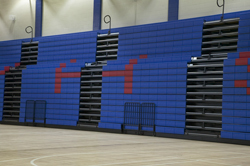 We offer Inspections and Servicing for your bleachers, athletic equipment, in wall cafeteria tables and operable walls. Folding Equipment Company was founded to provide superior quality wholesale school and office furniture to our wide customer base, while maintaining the highest level of personal service. We have years of experience in the distribution, installation and service of a variety of architectural specialty products throughout Northern Ohio and portions of Southern Michigan. When you choose Folding Equipment Company in Toledo, you are choosing a total solution provider. Contact a Folding Equipment Company representative today and let us provide the finishing touches to your auditorium, gymnasium, locker room, classroom, office or other facility.